Bertram Whittier Wells was an accomplished and influential ecologist and botanist, and an important advocate for studying plants as parts of natural communities. His book “The Natural Gardens of North Carolina”, published in 1932, is a classic work on the natural history of North Carolina. He retired in 1954, and moved to Rockcliff Farm, which was 150 acres at that time, and located on a peninsula at a bend in the Neuse River. He continued to study plants and wildflowers while also becoming an accomplished artist. It was during this time that Dr. Wells collected artifacts, mostly stone projectile points, along the riverbanks of the Neuse River. Zeagle’s Rock was a towering 55 foot outcrop with a projecting ledge that provided shelter from the elements. This landmark is known to have been a source of artifacts for archaeologists in the past. The entire base and lower half of the rock is now underwater due to the damming of the Neuse River to create Falls Lake. Jimmy Ray, whose family and home were Dr. Wells’ closest neighbors, also remembers finding stone points when plowing the large gardens at Rockcliff Farm. Dr. Wells, known as Uncle Bert to the neighboring children, fashioned homemade bows and arrows for the kids, later buying sets for them, and supervising them closely as they practiced. 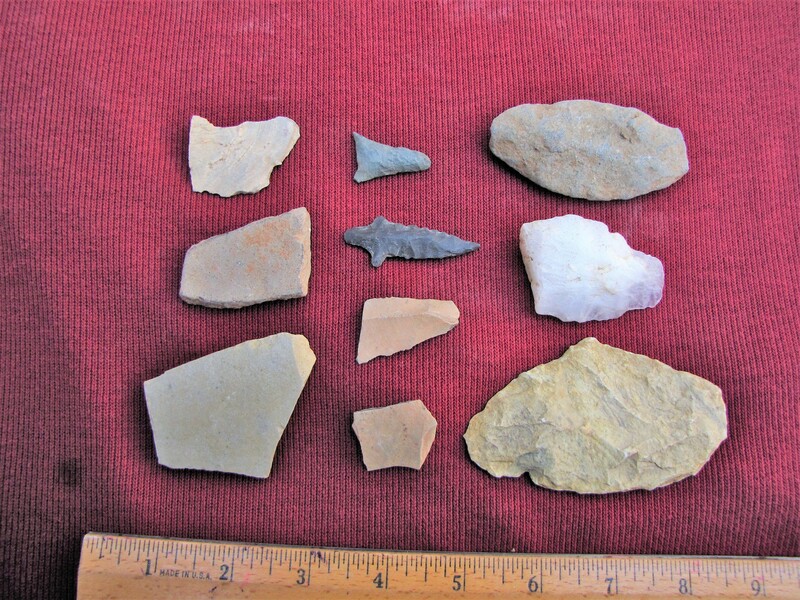 The following are photographs of selected artifacts that Dr. Wells collected at Rockcliff Farm and their approximate cultural time periods. 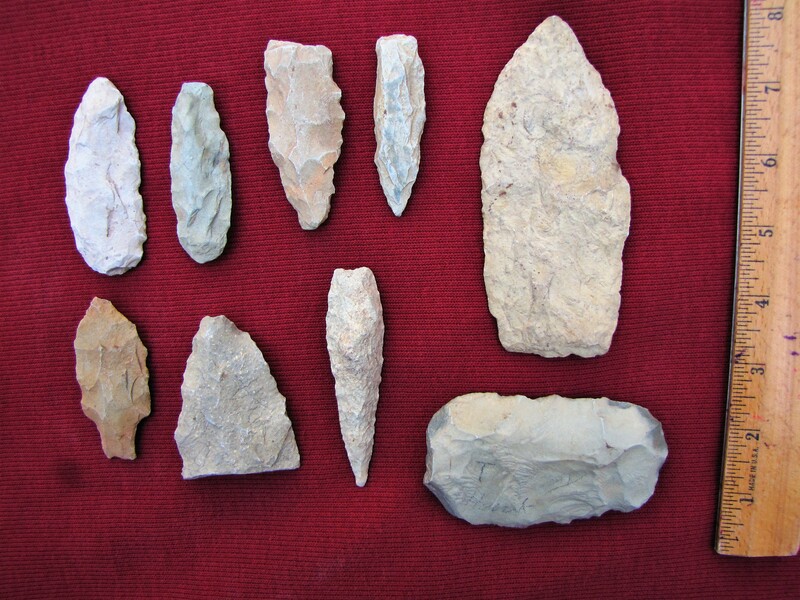 There are four general cultural periods used in the study of the prehistory of North Carolina. These are The Paleoindian Period (12,000 or more to 9,500 years before the present), The Archaic Period (9,500 to 4,000 years before the present), The Woodland Period (4,000 years to 400 years before the present), and The Mississippian Period (700 to 250 years before the present). 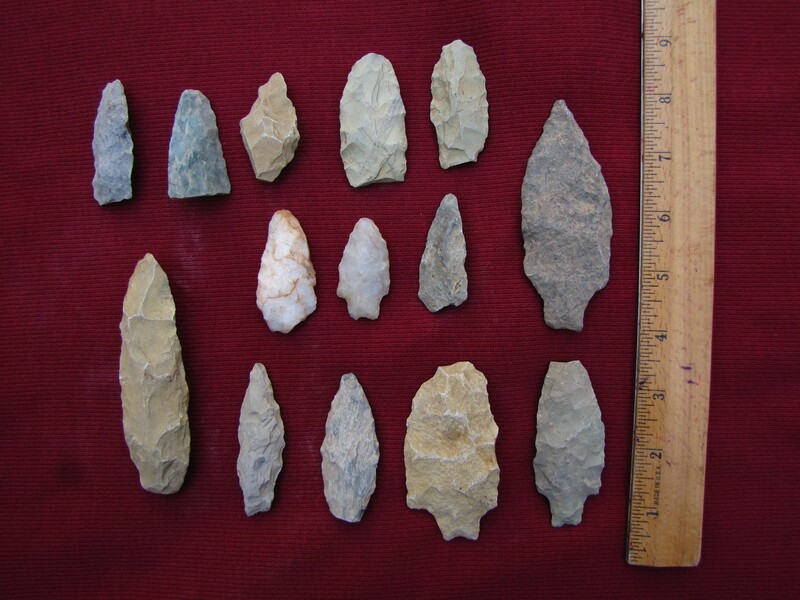 All of these cultural periods, except for the Paleoindian Period, are represented in the projectile points that Dr. Wells collected. We are extremely grateful to Assistant State Archaeologist David Cranford, PhD, who identified the projectile points and explained the cultural time periods they represented. The projectile points in the photo above are from the Early Archaic period and are most likely MacCorkle/ St. Albans points. They are the oldest points identified in the collection. The projectile points above are Guilford and other bifaces from the Middle Archaic period. The Guilford points are the longer, narrower points in the photo. Not all of the points in this or some of the other photos are readily identifiable, but they are included to show the diversity of the points that Dr. Wells collected. Bifaces are pieces of stone that have been flaked on both sides but have not been completed, either because they broke or because they were inferior or unusable and were discarded. 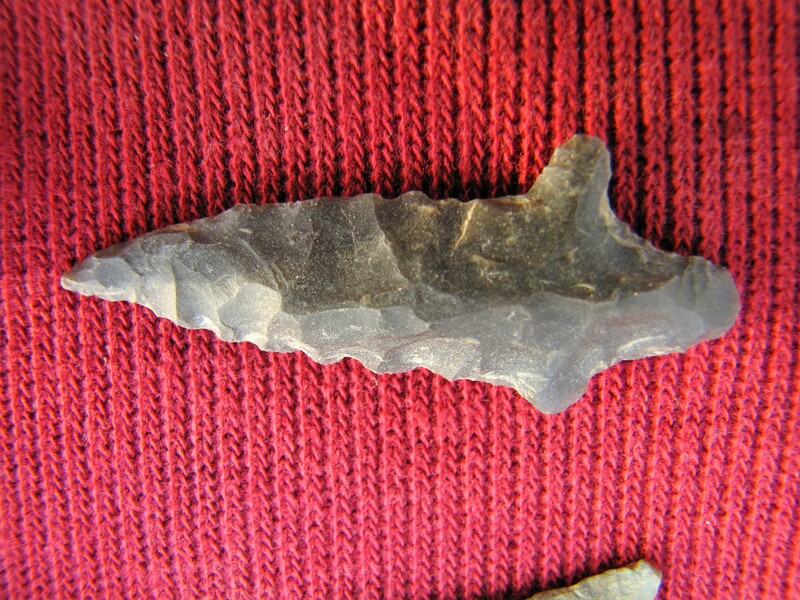 Above are Guilford and Savannah River Stemmed points from the Middle and Late Archaic Period. The Guilfords are the longer, narrower points; the Savannah River Stemmed are on the right. In the photograph above, pottery shards are located on the left and the bottom middle. 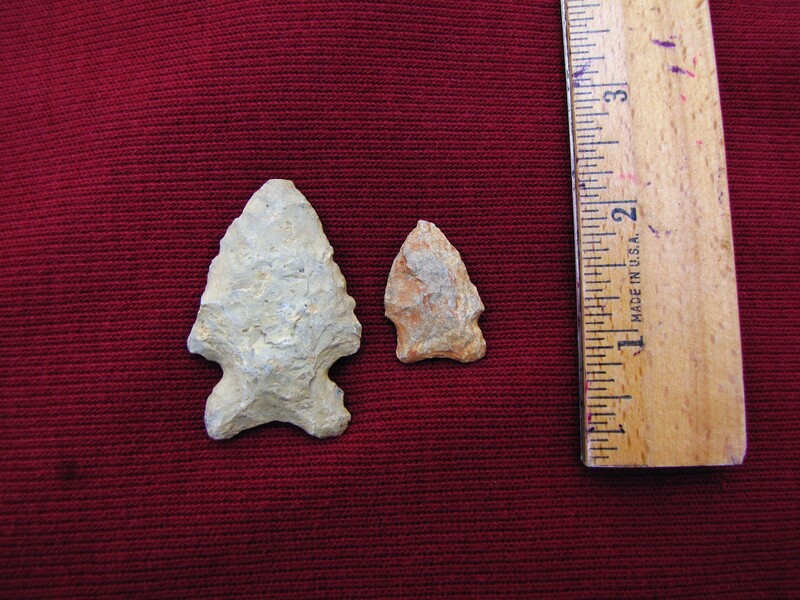 The top center triangular point appears to be a Yadkin or Caraway point from the Late Woodland period. The photograph below is possibly a Randolf point, from the Mississippian Period to historic times. As such, it would be the youngest stone point in the collection. It is a beautiful piece and quite sharp! A special thanks to Jimmy Ray and Brian Bockhahn for their insights into where and when the artifacts were collected. This entry was posted in Uncategorized and tagged Archaic period, B W Wells, bifaces, Caraway projectile point, Guilford projectile point, Historic period, MacCorkle projection point, Mississippian period, North Carolina Prehistory, Randolph Projectile Point, Rockcliff Farm, Savannah River Stemmed projectile point, St. Albans projectile point, Woodland Period, Yadkin projectile point. Bookmark the permalink.